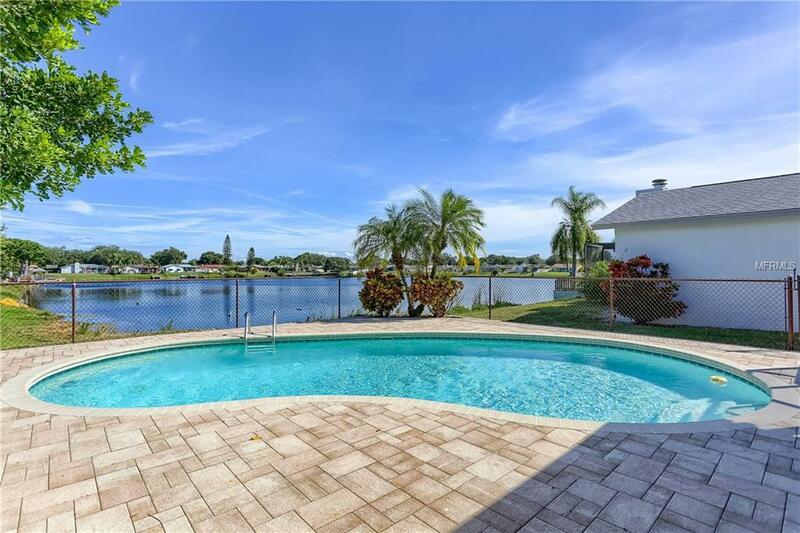 Live the Florida lifestyle in this bright and inviting 3 bedroom, 2 baths, 2 car garage waterfront home with private pool in Somerset Lakes. Enjoy your morning coffee and watch the sunrise over your sterling pool and pond in the backyard. You can even take a canoe or paddle boat out on the pond from your own backyard. This single-story home offers a split floor plan and includes brand-new stainless steel Whirlpool appliance package with transferable 3-year warranties, custom kitchen cabinets with slide-out shelves, and a large pantry. Enjoy beautiful features such as a fresh coat of paint on the exterior and interior of the home, custom vanity in the master bathroom, vaulted ceiling, skylights & a wood-burning fireplace in the Family Room, private pool with a paver stone pool deck and a large screened-in lanai accessible via 3 sliding glass doors, including one from the master bedroom. This home has been meticulously maintained by the original owner. Additional updates include: new windows and pavers in 2010, new HVAC and laminate flooring in 2018. Somerset Lakes is the perfect central location in Pinellas County just 20 minutes from Indian Rocks Beach and St. Petersburg/Clearwater Airport, 30 minutes to Tampa International Airport and close proximity to a number of shops and restaurants. Room measurements are approximate and should be verified by the buyer.